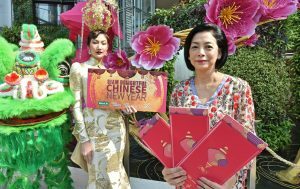 – Invest over 50 million baht in Chinese New Year celebrations with the “Siam Delightful Chinese New Year” campaign, attracting both Thai and international shoppers from around the world. – Celebrate the shopping spree during the beginning of the year by decorating three shopping centers with more than 999 beautiful Chinese lanterns, the symbol of brilliance, and importing gorgeous performances directly from China to impress all visitors. Don’t miss special promotions of the year! – Enjoy a new dimension to innovation!!! Get the “Digital Angpao” through modern technology, and let’s explore the 12 Chinese zodiac animals scattered through the AR application to win many prizes. Siam Piwat Co.,Ltd. the owner and operator of Siam Paragon, Siam Center and Siam Discovery under “One Siam” joining force with KBank Credit Card, have spent a budget worth over 50 million baht, on celebrating the greatest Chinese New Year by launching a campaign “Siam Delightful Chinese New Year” to attract both Thai and international shoppers to experience the excitement throughout the Siam area. With a decoration of more than 999 Chinese lanterns, imported gorgeous performances from China, and auspicious events, as well as promotions and special prizes of the year, all of this is for the Thai people and international tourists from all over the world from today until March 11 this year. Mrs. Mayuree Chaipromprasith, Senior Executive Vice President – Marketing of Siam Piwat Co., Ltd., said “To welcome the shopping season and the high season of tourism at the beginning of the year, the company has launched the “Siam Delightful Chinese New Year” campaign, thanks to its synergy as the “One Siam” to celebrate the Chinese New Year. The three shopping centers offer different types of activities, which we focus on new experience and innovations, and create something new for impressing our customers. Moreover, we have decorated the shopping centers to create a shopping atmosphere during the beginning of the year, emphasizing our shopping centers as the number one shopping destination in Bangkok. “Under ‘One Siam’ concept, Siam Paragon, Siam Center and Siam Discovery as one of the leading retailers in Thailand, we are confident that the number of visitors to three shopping centers will increase by more than 20 percent during this Chinese New Year period with higher spending. This corresponds to the rising traffic and strong tourism growth of the country, which is expected to grow constantly by 9 percent. For this year, we have a strategy to reach targeted tourists by focusing more on the Fully Independent Traveler or FIT. According to the Association of Thai Travel Agents (ATTA), the number and spending per head of FIT have increased largely during the past year. Hence, we have focused on this group of customers because they have strong purchasing power, especially Chinese tourists who love branded products and are ready to spend their money. The incoming Chinese New Year will be a long holiday for about 15-30 days, the Chinese tourists will travel abroad and one of the most popular destinations is Bangkok. The Tourism Authority of Thailand expects that in 2018, the Chinese tourist market will generate revenue of 5.61 billion baht, increased by 10.5 percent from the previous year, average spending at 55,000 baht per person per trip, increased of 4.38 percent from the previous year. Businesses that will benefit from rising spending include hotels, retail and shopping, and food. This campaign will continue to emphasize that we will deliver excellent service and create endless relationships with our customers,” Mrs. Mayuree said. Miss Chanisa Kaewruen, Senior Deputy Managing Director Marketing Event and Business Relationship Division of Siam Piwat Co., Ltd., said “Under the theme of “Lantern Festival”, this year event will be illuminated with 999 dazzling sculpted lanterns that symbolize prosperity to welcome the Chinese New Year. The installations in the shape of 12 Chinese zodiac animals measuring 2.5 meters in height dot the open space dwarfed by the 5-meter-tall dog-shaped centerpiece marking the Year of the Dog. As for the cutting-edge Siam Center, it is home to a massive selection of high-end fashion brands and creative artworks. No doubt it is tasked with mounting an exhibition of sculptures, designed by up-and-coming collage artist Nakrob Moonmanas, on the theme of All We Need is Love. The pictures interconnected with Chinese-inspired chinoiserie patterns featuring couples of various nationalities from all walks of life dressed in red, the symbolic color of good fortune. Moreover, the grand spectacles from China and fortune-enhancing activities are in the line-up to promote Chinese art and culture and further strengthen Sino-Thai relations. The Chinese Cultural Center of Thailand has joined hands to bring in a host of unforgettable productions involving an exuberant blending of China’s unique ethnic culture with Han Chinese influences. The shows, delivered by over 100 members of performance crews from the city of Hangzhou, in Zhejiang Province, China, include a graceful style of various dances, the jaw-dropping Kongzu acrobatics, and displays of ancient Chinese magic. The festival will also present a showcase for music played with Suona, a Chinese traditional musical instrument. In addition, our shopping centers have launched a new entertainment experience for customers to win rewards through “Digital Angpao”, an online entertainment channel for our shopping centers’ customers. Customers can click on linked URL of the shopping centers via Facebook and other online channels such as LINE, WeChat and Weibo, and then shake the mobile phone to get a chance to win digital Angpao and other rewards from February 11 to 18 this year. Moreover, we have also created “AR Application” to give a new experience for gamers. Gamers can download Flash Venture to seek for 12 Chinese zodiac animals scattered at three shopping centers to get a chance to win prizes from us. The AR Application will be available for playing from February 15-18. Mrs. Jiraporn Srisa-an, Senior Deputy Managing Director, Business Promotion, Siam Piwat Co., Ltd., said that “Besides, the fun activities through the technology world, ‘One Siam’ has continued to launch a campaign to satisfy both Thai and international customers. By joining forces with over 500 leading shops in all three shopping centers to offer rewards worth over 9 million baht. Customers just spend in accordance with the three shopping centers’ conditions, and will get instant rewards such as gold bars, 5-star luxury hotel package, vouchers from IHOP restaurant and Siam Gift Cards and etc. Special! For K-Credit Card customers, get up to 50 percent discount privileges from leading stores, and get more cash back, while also getting a chance to win the FIFA World Cup ticket to Russia. In addition, seven leading credit card partners, including AEON, Citibank, KRUNGSRI, KTC, SCB and Thanachart, will also offer special privileges such as credit rewards, and special gifts, and cash back up to 18 percent. Moreover, for the Chinese New Year period, during February 14-18 this year, there will be troops of lion dancers offering discount vouchers to Thai and foreign tourists who visit the three shopping centers. All of them will have first-hand experience with many leading shops and attractions in Siam paragon, Siam center, and Siam Discovery including Sealife, Madame Tussauds Bangkok, and Kidzania, all of which are a world-class destinations for travelers to enjoy a full-fledged travel experience at one of the city’s premier shopping centers. Exclusively for international tourists, they also have the chance to get special rewards from the three shopping centers. International tourists just spend in accordance with the three shopping centers’ conditions, and will get premiums, vouchers, and discounts. For UnionPay customers, just spend in accordance with the condition, they will get 150 baht discount, while Chinese customers, just spend through WeChat Pay in accordance with its condition, receive a maximum of 2,018 Yuan rewards, and additional discount up to 80 Yuan for their next spending with a minimum of 800 Yuan. Let’s celebrate the greatest happiness and welcome the Year of Dog with auspiciousness, while also enjoying special promotion campaign “Siam Delightful Chinese New Year” at Siam Paragon, Siam Center, and Siam Discovery from today until March 11, 2018.